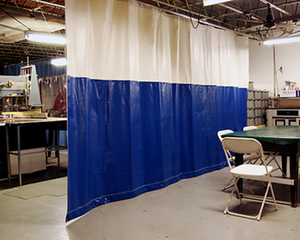 There are countless industrial operations that require a barrier for either safety purposes or as an environmental partition. 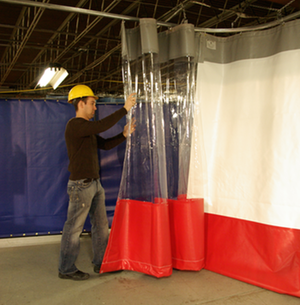 Curtains walls protect people and property against dust, dirt, fumes, ultraviolet light, temperature, noise, overspray, odor and welding hazards. Regardless of the underlying factor leading to the need for a curtain wall solution, your requirements and the curtain's fundamental function are what really matter. 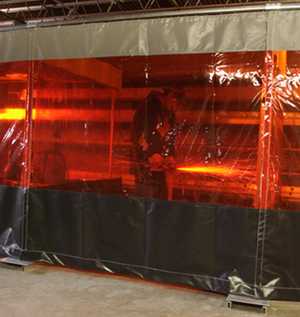 Operations such as grinding or sandblasting would require a different set of characteristics than would an operation such as welding. With Verilon®, color, size, and vinyl specifications can all be tailored to whatever your needs happen to be. We also offer track mounting systems to meet your specific application. Trust us to keep your work environment safe, organized and hassle free.